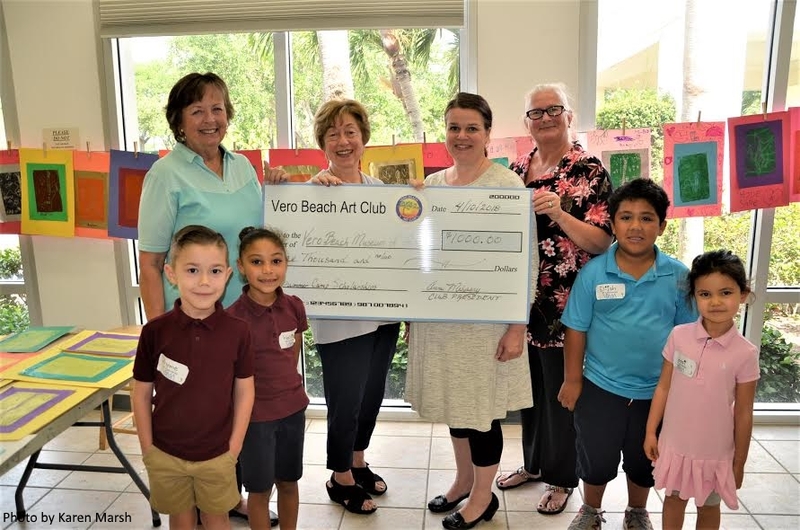 The Vero Beach Art Club, formed in 1936, is an independent, non-profit organization serving its members and the Vero Beach art community through, education, exhibitions, social events and monthly meetings with special programs and guest artists. The public is always welcome to attend our monthly meetings. Our Events are free to attend and open to the public. They feature many of our talented artists. Also be sure to see our Artists Gallery with artwork for sale by our members. Gonzalez Room in the Education Wing (3001 Riverside Park Dr, Vero Beach, FL 32963). Our Annual Luncheon held each year in May is at a local restaurant. Reservations and payment are required by the deadline Monday, April 29th. Click on the button below for details. OUR NEW OFFICERS WILL BE INDUCTED AT THIS MEETING. Click on the button below for our 2019 Award Winners. Award winners have been announced. Many of our events have open application periods now and the rest will soon follow. Click on a link below for a complete list. Pages will be updated as information become available. We award scholarships to Indian River County graduating seniors who wish to pursue a degree in art. Winners also receive a free one year membership allowing them to exhibit and sell their art. Our Scholarship and Education Fund needs your support. Many of our event proceeds are used help support our charitable giving through scholarships, and donations to area students and art related camps. Please show your support today for our future artists today! Please consider a gift to the Vero Beach Art Club in your financial arrangements. What better legacy to leave than that of a scholarship or show award in the name of a loved one. You may also consider a gift or artwork or real estate to benefit our local artists, students and community. Our events are just gearing up with open application periods. If you would like to attend any of our events, click on the All Event button below for a full list of exhibits, shows and educational opportunities. Vero Beach Art Club members are able to exhibit one piece of 2D artwork every quarter. The new exhibit started Wednesday, March 13th at the Main Branch downtown Vero Beach during library hours. For a full list of shows & sales, exhibits and educational opportunities, please click on the button below. To help our members keep up with all of the art related events happening in and around our community we are providing a link to the Cultural Council of Indian River County calendar. That way you can check to make sure you are involved in everything ART in our area. Join our Club and become connected with artists in our community. Exhibit and sell your work, create an online gallery to showcase your pieces and more. Portions of the sales from many of our shows fund scholarships awarded to graduating seniors who wish to pursue an art related course of study. Scholarship Winners announced for 2019 - click on the button below. We have many events throughout the year for our members to exhibit and/or sell their work. Make sure you don't miss one. Members receive discounts from local businesses. Awards and Cash Prizes are offered at some of our events. Our artists volunteer to beautify our community by creating art in public places. See our murals, bench, and other projects on our Beautify Vero pages. We would love to have you join our Club and volunteer. Our membership is made up of a diverse groups of artists from the ages 09 and under (we now offer Youth Membership for those age 11 and under - FREE). They volunteer at our events and in many projects to bring art to our community. Giving back to the community and its future artists our Club lives on for many generations. Our local art students are our future artists, contributors and volunteers. With so many opportunities to show, sell and hone our talents, you'll want to be a part of everything. We have many shows and sales throughout the year for our members. Be sure to see all our events to make sure you don't miss out on an opportunity. Artists have the opportunity to hone their talents at our drop in Open Studios starting September through April. 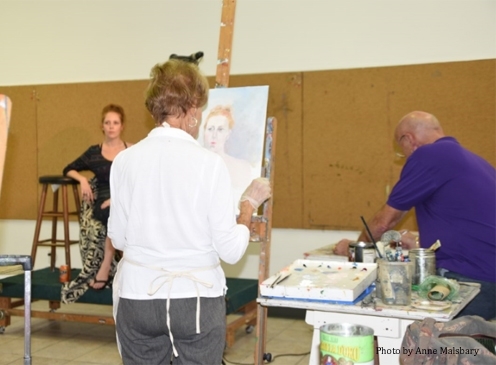 Vero Beach Art Club Members receive a discount. We offer Workshops during the year with renowned and local artists. Our members attend at a reduced price. Be sure to check back often for new and upcoming workshops. Our artists are an integral part of the art community, offering their talent to make our greater Vero Beach community a more beautiful place. From painting murals around the area, to attracting tourists through our many events, we bring people more in touch with their creative side. Our new Mentoring program is designed to help encourage and promote our young artists. We provide scholarships, donate to different organizations and classroom teachers and all in the name of ART. By helping to support art in our community, we hope to encourage budding artists to expand their horizons and think beyond the classroom to real world skills to utilize their talents. Our generous donations help art teachers provide art materials for their classrooms, support museum camp scholarships and more. We offer Junior Membership for ages 12 - 17. With so many talented art students right here in Vero Beach, we are so fortunate that our events allow us to offer Scholarships to graduating seniors who have been accepted to study art at accredited higher education institution. We also contribute to the Vero Beach Museum of Art to help provide scholarships for local youth to attend their Summer Art Camps. Our dedicated artists have volunteered to paint several murals and a bench that was donated to be auctioned off for the Hibiscus Children's Center. The murals are located at the Vero Beach Community Center, the Racquetball Building in Riverside Park, the wall on SR60 by Commerce Ave., and the historic Bethel Creek House across from Jaycee Park.